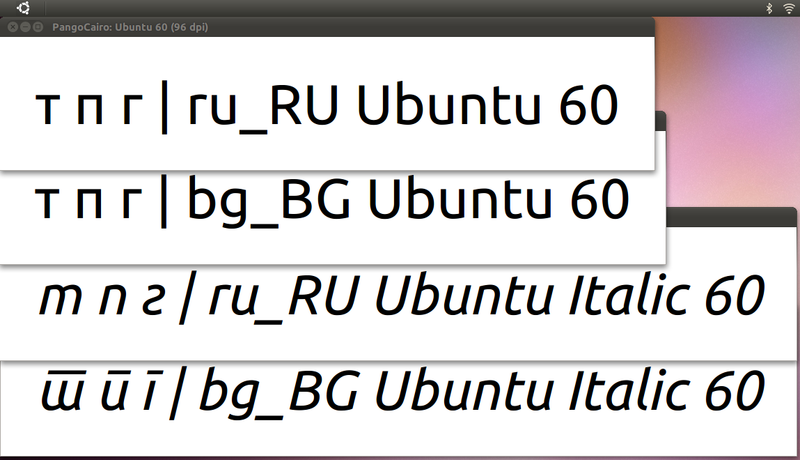 The Ubuntu Font Family has number of Cyrillic letter forms; upright and italic glyph differ considerably for some codepoints. 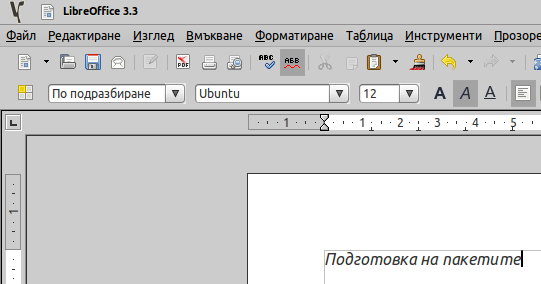 In additional, the Ubuntu Font Family tries to support localised Cyrillic alphabets. In Bulgarian, some of the forms look unfamiliar. I am not sure when this bug appears - sometimes the letter is correct, and sometimes - not. The attached screenshot is taken from my forum, using the Ubuntu font. This can be easily reporduced with Synaptic when a package is installed/upgraded - see attached screenshot. I believe that my system is properly configured for Bulgarian language environment, but nevertheless the problem occurs - see attached screenshot. Well actually this is not really incorrect, according Wikipedia. On your system the font seems to use the Serbian/Macedonian glyphs. I do not understand how or why the font chooses the correct or incorrect glyphs but the glyphs in your screen-short are considered italic Cyrillic glyphs for Serbian/Macedonian. In other countries with Cyrillic there are used other italic glyphs. May I ask which language you actually speak/write and which language you use on your system? We speak/write Bulgarian, and we use Bulgarian locale. My locale output and speaking/writing language are identical to lokster's. Just an idea: Could the font be considering these glyphs to be correct for Bulgarian? From time to time I use/read/write Russian texts with Cyrillic, even though my locale is German “de_DE.UFT-8”. I never saw those Serbian/Macedonian italic glyphs. we'll have to undo the OpenType features. Some Bulgarians use these symbols when handwriting, but as far as I know, they are not officially accepted. This is clearly wrong. For comparison see how the wrong letters from the Synaptic's screen shot look in LibreOffice with the same font and style. This is the correct rendering of bulgarian "г", "п", and "т". Both edits are by Anonymous and without cited references. This John Daggett post http://hacks.mozilla.org/2010/11/firefox-4-font-feature-support/ of November 2010 reiterates the statement, not sure if it's from another source. In 1999 a thread on the Unicode mailing list covered the topic http://www.unicode.org/mail-arch/unicode-ml/Archives-Old/UML020/thread.html#804 but nobody mentioned Bulgarian having those Serbian/Macedonian letterforms. Either way, we need to investigate further, and come to a firm conclusion. Well if the uprights are different in Bulgarian, it's another set of substitutions. I guess http://typophile.com/node/32397 has some good examples. However, it doesn't seem these variants are standard but rather font specific (see the different Macdonald's). Well, as I said, my mother is a primary school teacher. In Bulgaria. She teaches the kids how to write Bulgarian (for almost 30 years now), and it is not the way Wikipedia claims. Even in handwritten text, these symbols are wrong, according to her textbooks. Actually, only the fancy symbol fot "т" is used sometimes. The strange symbols for "г" and "п" are NEVER used. I haven't seen them in Bulgarian text (especially the "г" symbol). 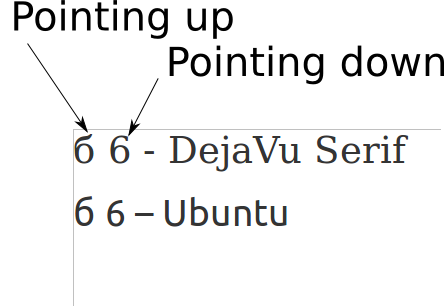 Only in the Ubuntu font. I don't know why some people use this "т" symbol when handwriting - it's not officially accepted nor widely used. Maybe because in handwritten text it doesn't look so bad, and it's not very big deal if someone is using it. But on screen, books, magazines it makes the text unreadable and unnatural for Bulgarians. By the way Macedonian language is actually Bulgarian with strong Serbian influence. Lokster: Thank you for raising this (and please also pass on thanks to your mother for her experience!). I'm trying to get some high-level context into this bug report, and also some definite hard facts about which codepoints we're discussing about. If we can narrow down the question/focus it'll be easier to get input from the Ubuntu Bulgarian Loco team (although I don't think there is that much traffic on the 'ubuntu-bg' list). "although I don't think there is that much traffic on the 'ubuntu-bg' list"
I hope it will help at least a little to solve this, because I really like the way Ubuntu font looks. See attached photo of a primer used in the elementary school in Bulgaria. results in the following four images. Are the standard Russian (cursive, italics) forms what you're used to, and expecting to see? Which of the four images are correct, and which are wrong? The first three are correct, the fourth is not. Paul Sladen: Unoficially and only in rare ocasions some people draw the "т" letter as in the fourth example. But this is uncommon and not wide accepted. The other two letters as shown in the fourth example are plain alien and confusing to any bulgarian user, especially the "г" letter. Off-topic: I'm not particularly a fan of the 'locl' tables since they introduce this sort of variance and debugging, but if there's a case for using them, then there might be some scope for some further tweaks; eg. doing Г→D to match the current г→g cursive. Perhaps Ж and Т→m. Those who are native Bulgarian readers, what's your thoughts towards б looking more like a 6 or a δ too? Our "б" symbol must be closer to the Greek "delta" than to "6" (six). trivial to adjust the fonts to match cultural expectations. Is this will be fixed untill Natty release date? Shiraaz, David: are we at the state of having enough information available to actually implement this (swapping the alternates around is very easy compared with knowing /which/ should be the default). From one of my old contacts at the University of Nottingham Slavonic Studies department suggested talking to John A Dunn at Glasgow as being a starting point. Lokster, Svetoslav: are you happy if these three gets tweaked in this round, then we review it again and see if there are any alternatives that can be improved the next time around too (the aim is to get it correct, even if it takes a few goes!). object to the plan at this point, I would regard it as safe to implement. I think there will be no objections to this change. At least, from Bulgarian-speakers. If we document "the plan" before we do it, we can hopefully do it. In this case, that means which mappings we're going to change, and what to. lokster: it should be sooner, hopefully this month... but we'll have to wait and see. 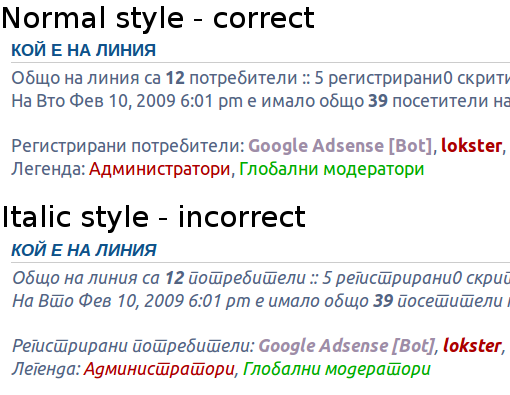 Screengrab of current (0.71) locale tables for Russian/Serbian/Bulgarian. Please could everyone double check that the locale mapping currently shipping in 0.71 (see screenshot) are current. I can confirm that at least the Bulgarian letters look OK now. Correction. Not everything is OK. The Bulgarian "б" letter on the screenshot must look like the Russian "б", and not like the Serbian/Macedonian. It must not look like the greek "delta" - I explained this in my previous posts. It's not very big difference, and most Bulgarians will not notice it (especially when using small font size), but it's wrong to write it that way nevertheless. 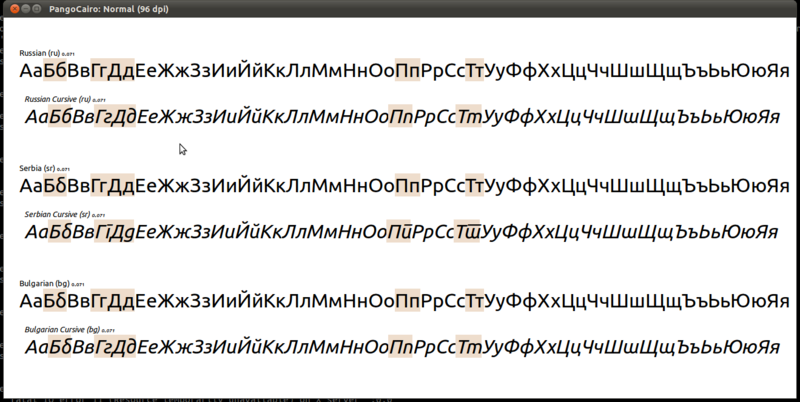 For reference see the photo in https://bugs.launchpad.net/ubuntu-font-family/+bug/708578/comments/20 and https://secure.wikimedia.org/wikipedia/en/wiki/File:Special_Cyrillics.png ("Standard" Cyrillic, not Macedonian/Serbian). I know that in Russia both variants (g and ∂) of the д are used as cursive forms. I cannot tell which one is more often used or even is expected. The cursive forms of the other letters are definitely correct for Russian language in the png-file posted by Paul. adoa: just to confirm (same thing, but phrased differently) "the Bulgarian and Russians forms should be identical for all letters, and in every way. They Serbian forms are not used at all" ? Actually, the Bulgarian cursive form must look like the Serbian, and the normal form must look like the Russian (if it's possible). According to the school primer. It makes sense to me, so I guess this is the right way. But It's not a big deal actually. The most important part was that with the "т, п, г" letters. Do you have any contacts in the academic (study of language/type or design business), or would you be able to gather eg. photographs (in addition to the one sampler in comment #20. Looking at the Typophile thread, the last post notes that a tendency to raise 'в' to ascender height (and to add ascenders to other letters). Does that description fit? No, I don't have this kind of contacts, but I will try to gather some more photographic evidence. Anyway, I want to say that you've done great work with ubuntu font family. Well we do collectively want it to be right for as many people and languages in the end as possible. For the Bulgarian б, I'm hoping that we can collect a bunch of support "evidence", attach it to a (new) bug report just about the Bulgarian б upright/cursive and then it's clear for anyone who comes back, as to why the change was made (so hopefully avoiding switching back and forth too much while people are still gathering input). This isn't shipped yet, but hopefully in the next few months we can ship that and check if everyone is happy with the result.